Castor oil is a pale yellow oil that comes from castor beans which has many uses around the home. Because it’s also a laxative, many women have found success drinking castor oil to induce labor towards the end of pregnancy. But is castor oil a reasonable and safe choice? In this blog post we discuss the ins and outs (mostly outs… ha!) of using castor oil to induce labor. Let’s get started! WARNING: Castor oil to induce labor should never be used independently of a care provider. Only when you have the guidance and approval of a trusted care provider, should castor oil be considered and administered. Castor oil is a laxative, meaning that it makes the body poop (a lot!) and clears out the bowels. Bowel stimulation also stimulates the uterus, leading to contractions, which can increase signs of labor, start labor, or make labor stronger. Unfortunately, rubbing castor oil on the belly does not induce labor. Does Castor Oil to Induce Labor Work? When To Take Castor Oil? I am passionate about helping women have a healthy pregnancy, natural childbirth and a happy postpartum. Therefore, I don’t recommend starting or even encouraging labor before mom and baby are completely ready, even if all that is used are natural ways to induce labor. According to the March of Dimes, babies need to stay in until at least 39 weeks. Babies born too early may have more health problems at birth and later in life than babies born later. Being pregnant 39 weeks gives your baby’s body all the time it needs to grow. Important organs, like his brain, lungs and liver, get the time they need to develop. He has time to gain more weight in the womb. Babies born at a healthy weight have an easier time staying warm than babies born too small. I am a huge advocate for natural, hands off birth and letting the body do its thing. It’s a big deal to induce labor, even when using natural ways to induce labor. However, sometimes special circumstances (MEDICALLY NECESSARY) arise that call for getting things started. In these special circumstances, it may be wise to use natural methods to induce labor before using medications like cervadil or pitocin. Natural methods of induction are typically more mild and safe for mom and baby. If for whatever reason baby needs to be born, use castor oil to induce labor at 39 weeks at the earliest, preferably 40-42. However, in my opinion castor oil should only be used as a last resort before moving towards more pharmacological methods of induction. How Much Castor Oil Does it Take to Induce Labor? To use castor oil to induce labor use the following instructions. Wake up rested and eat a good breakfast. Arrange childcare for your already-born children. Pack your hospital bags and be ready to go to the hospital at a moment’s notice. Plan to drink 2-3 ounces of castor oil all at once. Mix it with an enticing beverage of your choice such as a milkshake, juice, or a cold coke. Drink it by itself, or try cooking some eggs with it. Whatever you try, just know that it won’t taste good. The mild taste combined with the extremely thick texture is just gross. Don’t try to taste it before you swallow it. Just chug it. 2-3 hours later, you will likely find yourself on the toilet. Stay hydrated. It’s going to be ok.
Use baby wipes, and be gentle with your rear. Hemorrhoids are a possibility at this point. It’s going to be ok.
You may throw up. Stay hydrated. It’s going to be ok.
Go into labor and have a baby! Once upon a time I was 40 weeks pregnant with my third child. Late Saturday evening my water broke, but strong labor never followed. Eventually, after trying a barrage of natural labor induction techniques, my midwife and I decided to use castor oil to induce labor. Here’s my story. “Later on we ate breakfast, my kids went over to my neighbor’s and then we chatted with my midwife about what our plan of action should be. Nothing had changed for the better, if anything it seemed like my contractions were even wimpier and further apart. We decided that I would do castor oil and castor oil is what I did. Matt went to a drugstore and came back with a 4 ounce bottle of that nasty stuff. I drank about 3 ounces of it. I wasn’t messing around anymore. This was at 10 am and we immediately took naps knowing that I would soon be pooping a lot, trying to have a baby. Around noon I woke up and puked. Then pooped. A lot. And pooped some more and then puked again. Then pooped some more. And then again. It was a certain kind of hell… that I was sure about. At this point I was having contractions about 2-3 minutes apart. I decided to check myself (used a sterile glove to minimize any potential infection) and noticed the baby was lower than previous days, but I couldn’t really tell if there was any progress with the cervix. The glove made things feel even weirder than usual. I spent that afternoon on the toilet and napping. I ate something at some point, but I can’t remember what. And of course, I stayed very well hydrated. Yeah… that’s castor oil. Use only as a last resort, people! Later my contractions were coming every 2-5 minutes apart and were definitely stronger than before. Around 2 pm I told my midwife maybe she should come over but not to sue me if everything fizzled out. She, as usual, didn’t care about false alarms and wanted to help me and do her job. I love her. 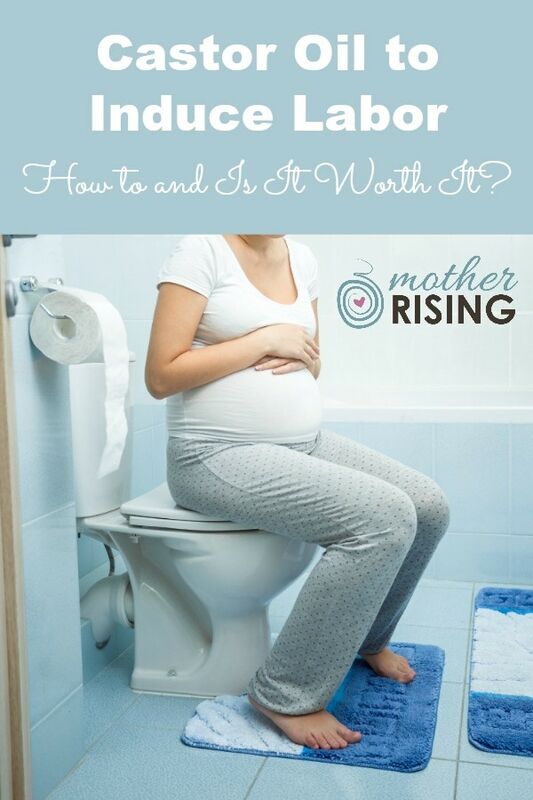 SIDE NOTE: I did not poop while pushing out my baby. There was nothing left to poop! Yay castor oil. For what it’s worth, I personally know a good handful of people that have found success with castor oil. Pulling the trigger to try castor oil to induce labor should bring you pause – it’s a big decision. Use the following list, along with your care provider, to figure out the best course of action for you and your baby. I suppose there’s always a risk of castor oil leading to an extremely fast birth. Hey, it happened to a friend of mine! A friend of mine that’s a midwife at a local freestanding birth center uses both of the following castor oil recipes to induce labor with her clients. Instructions: Combine ingredients in a blender. For the best experience, drink entire “milkshake” with a straw. Instructions: Combine ingredients in a blender. For the best experience, drink entire “smoothie” with a straw. Of course, castor oil is not the only option for a natural induction. Isn’t it nice to have options? Speak with your care provider to discuss other methods of induction besides castor oil. I bet they have even more ideas and information to share with you! Castor Oil to Induce Labor: How About You? Did you use castor oil to induce labor? What was your experience? Leave a comment and share your story with the Mother Rising community. We’d love to learn from you! I am in 40 week i take castor oil 2 times but i havent labor, what can i do? I used cator oil at 39 weeks 3 days with permission of my OB. She had stripped me two days prior and I has already lost my mucous plug. I took 2 tablespoons of cator oil, mixed with orange juice around 6 am. From 11 to 2 I was non stop on the toilet. Around 230 I had my bloody show and mild contractions started. Went about my day. Around 1 am my contractions were 5 minutes apart and i went tp the hospital. I was 1.5 cm dialated and my cervix was soft. After two hours, I was sent home due to no progress. So about 5 am, my water broke in a giant gush. I was sitting on the toilet because I felt like I had to go to the bathroom. My contractions felt much better. I laid down next to my husband and tried to rest but contractions started getting more intense. I woke up my husband and told him my water broke and we got back to the hospital around 630 am. Since they had only sent me home a few hours ago they took a while to get to me. When the nurse finally came in, she told me I was fully dilated and they rushed me to labor and delivery and had me start pushing at 7 am. I had my daughter at 758 am. No epidural due to getting to the hospital too late.